A visibly nervous Armin Laschet, the minister-president of the German state of North-Rhine Westphalia opened the ceremony for the Treaty of Aachen in somewhat shaky French on Tuesday (22 January). Sat in front of him were many government representatives from France and Germany, as well as ministers, mayors and, from the EU, the President of the European Commission Jean-Claude Juncker and the President of the European Council, Donald Tusk. The treaty signed by both countries represented the opposite of “my country first,” Laschet said. Germany and France, 56 years after the Élysée Treaty was signed, committed to wide-ranging cooperation in the fields of culture, education, research, mobility and climate protection. The first chapter of the Treaty of Aachen covered Europe. But this was not entirely altruistic. Emmanuel Macron, once the new figurehead for a young, liberal Europe on the rise, is under immense domestic political pressure. In May 2018, he stood in the coronation room of the Aachen town hall to receive the Charlemagne prize for his commitment to Europe. “Before the European elections, because of the heated internal political situation, Macron has to regain momentum. His hope of recovering his lost constructive strength is connected to reviving the Élysée Treaty,” believed French specialist Julie Hamann from the German Council on Foreign Relations (DGAP). But Macron’s proposals for a deeper EU have received only lukewarm support, including in Germany, where there is the fear that making too many concessions to the EU would lead to the far-right AfD gaining more strength. Macron therefore needs successes. The French president was both aware of this and made reference to this in his speech. “Sometimes Europe is doing badly, sometimes we don’t move forward quickly enough. But we have to look at the successes that we have achieved in Europe,” he said. Last summer, Macron was finally able to get some important promises from his “Angela,” as he is comfortable calling the German Chancellor, in Meseberg. Some of these have now been cemented in the Treaty of Aachen. For instance, a common approach to arms export is to be developed – an area where these countries have traditionally had entirely different points of view. Macron’s call for a European army also appears, at least indirectly. Both countries promise to “develop the capacity of the EU in the military sphere” and to establish a common security council. In November, the German defence minister von der Leyen rejected the idea of creating a French-German army. “We’ve never gone so far and so explicitly in the area of common defence,” the president’s office said. Hamann from the DGAP had a sober view of this. “The treaty may commit both states to continue negotiating their major differences of the opinion. But I don’t expect the common security policy will be easier to shape as a result of signing this,” she said. This also applies to other points, such as energy policy. The planned harmonisation of both countries’ economic laws may also be a tough process. “There is much work ahead of us,” Merkel said in her speech. Most of the points of the Treaty of Aachen’s 26 articles remain vague, while critics complain about the lack of concrete concessions. 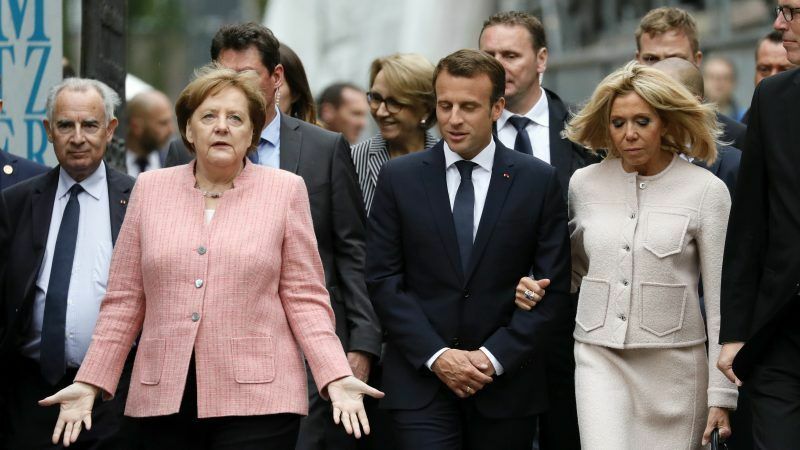 “Of course, you can criticise the lack of concrete points, but this text is a treaty, it has been made to last for decades, it’s not a decree,” said Christophe Arend from La République En Marche (LREM), who is also the chair of the Franco-German friendship group at the Élysée. In an EU hit by a crisis, it was primarily a matter of having a strong alliance in Europe, Macron said at the end of his speech. “France and Germany have to show responsibility and make their voices heard,” he said in reference to Europe’s much vaunted “German-French engine.” But does it still exist? Hamann believed so, as long as both states were aware that unity was required to push forward European reforms. “But the formula that Germany and France reach an agreement and the other states will follow them no longer works. The way of doing European politics has changed in light of major crises and internal blockades, like Brexit,” she added. 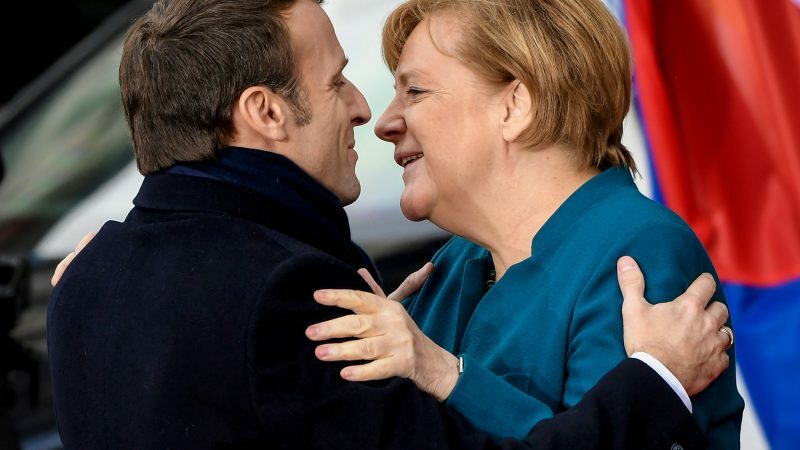 Macron said the power of the Franco-German alliance could not be underestimated, while Merkel stressed there now needed to be the determination to “really fill the treaty with life”. “I think we do have the absolute determination to do this,” she added.